We were told that we could not visit the Jewish Synagogue today, because it was Shabbat. On further inquiry yesterday, though, Jay found that there was a service that we could attend. After breakfast we drove, then walked, to the synagogue, where we were told services would start at 8:45. We walked past many interesting shops, some of which were been swept out and prepared for opening. We waited outside the synagogue, while the guard opened the door, but made it clear that we were not welcome to enter until a congregant arrived. The once-thriving Jewish community that numbered over 100,000 has dwindled to less than a minyan, almost all of them elderly. More than an hour late, we were surprised to see a tall, thin man, dressed in black, with a hat and a long beard stride down the street, with a few others. Turns out that he is a member of Chabad from Israel who, with his wife, have lived in Cochin for more than two years, seeking to keep the Jewish community alive. We walked into the synagogue, the women sitting in an area in back, separate from the main synagogue. Eleven hundred handmade tiles decorate the floor, lamps and chandeliers from Europe hang from the ceiling, and wooden benches line the sides of the room. A wooden and brass circular structure is in the center and serves as the bimah. We chat briefly with the rabbi, who asks our Hebrew names, which I know, but Steve does not. He asks how long we can stay and seems disappointed, but not surprised or dismissive, when we tell him only a short time. There are eleven men in the service, which I think is an unusual crowd for the synagogue. Several are young Israelis and one an older gentlemen, born in Rumania, but now living in Baltimore, who travels the world in his spice trade business. Certainly there could be no more appropriate place to pray than Cochin for one in that trade. He is friendly and chatty. He and his wife moved last night to a small hotel near the synagogue so that he could walk to services this morning. The services are “led” first by one young man and then by the rabbi. “Led” consists of davening, sometimes inaudibly and sometimes chanting in the structure in the center. I can pick up and join in on only a few prayers. There is something sad and lovely about praying in this more than four century-old synagogue, knowing that Jews around the world are all participating in the same type of worship. Of course, Jews were not the only foreigners to influence this area. Kerala, and especially Cochin, was one of the main ports on the spice route. 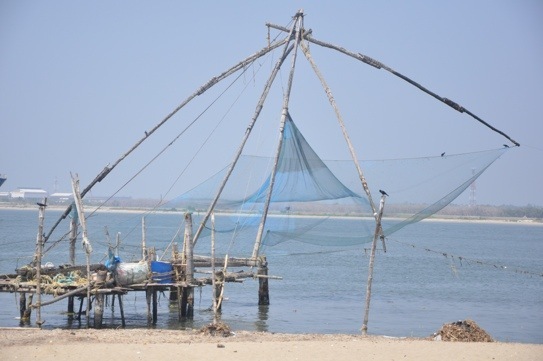 The history of Kerala reflects the significant influences these spice traders left behind. Christianity first came to India through Kerala, and the Islamic influence in the state can be seen when traveling north. Even after they left, the cultural influence is still seen in the architecture of Cochin. We stay at the synagogue for less than an hour, make a contribution on the way out and then wander back to our bus past interesting stores that we do not have any real time to explore. We walk with Jay and the Sugarmans along the area that Carol and I walked yesterday morning, and Jay explains what is going on. 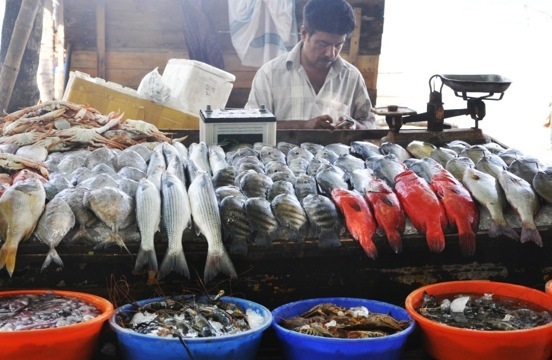 We stop to watch some very quick auctions of freshly caught fish that will be taken to hotels and shops, and sold today. We continue walking through the narrow roads of the area that is today referred to as the Heritage Zone, seeing various architectural styles reflecting the many cultures that lived here. Dutch houses stand next to spacious porticoed British plantation style homes. Further down, we go through the Church of St Francis, built by the Portuguese. We return to the hotel and have lunch with the Sugarmans, who are about to check out of the hotel, as they are moving to a new city in Kerala tonight. We take the bus to the Mattancherri Palace, which was commissioned by the Portuguese for the Raja of Kochi in exchange for trading rights, and remodeled extensively by the Dutch. The palace is two stories high and is built in the traditional Kerala style known as “nalukattu” (four buildings around a central courtyard). Made of wood and richly carved, the palace exhibits memorabilia from the Raja of Kochi’s collection, but it is best known for its outstanding murals painted on the walls. Fast fading, you can still see some of these excellent 16th century paintings illustrating episodes from the great Indian epic – The Ramayana. This is an interesting place, but we don’t really have enough time to digest it. Kochi’s ancient Shiva Temple is popularly known as Ernakulathappan (catchy, huh?). 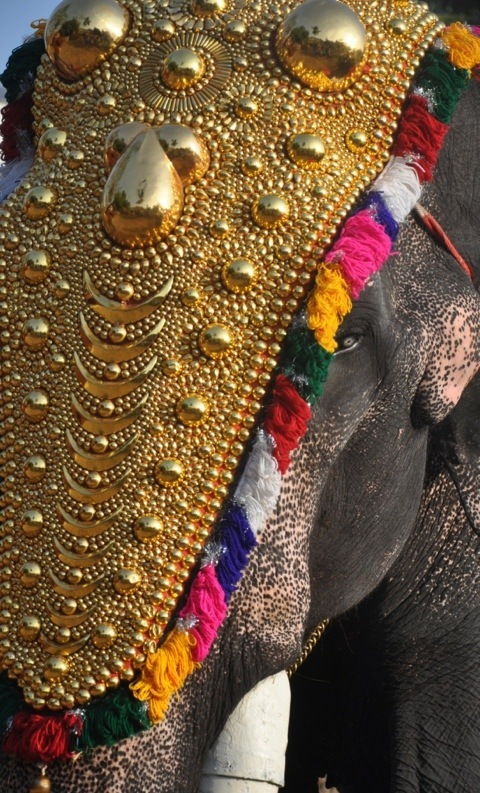 The annual festival in the deity’s honor, Ernakulathappan Uthsavom, is today and includes a procession with caparisoned elephants, special pujas, classical dances, concerts and firework displays. 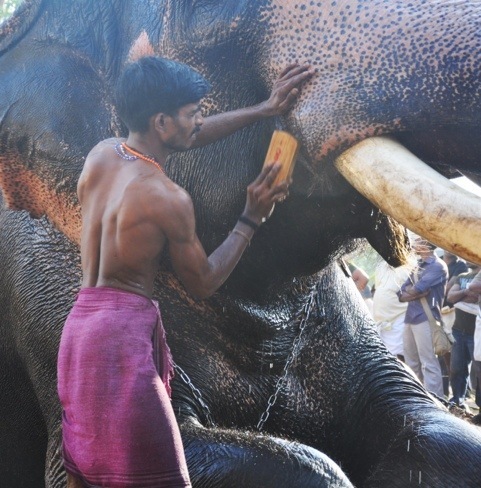 Because of our timing, we are able only to catch the bathing and decorating of the elephants, but that is quite fun to see, and, at least we had a taste of the festival (albeit a small taste) last night. Too bad that we can’t see the full-blown festival, but you can’t catch everything. We say goodbye to Karen and Steven. In a touching show I’d affection, Karen gives Carol and me six Sodukos (or however you spell the damn things) to frustrate us on our trip home. It’s been as marvelous to be with the Sugarmans as we’d anticipated, and we had very high expectations. We ride back to the hotel and say goodbye to Jay, who has been a wonderful guide. He is knowledgable on an incredible range of topics, and could not have been more flexible in accommodating all of our whims and changes of plans. Most recently, he facilitated, with Shonali and her amazing group at Peirce & Leslie, getting an earlier flight to Mumbai tomorrow, arranging for us to see some of the slums there and changing the arrival time for us at the hotel in Mumbai. Carol is at an hour-long cooking class that she had signed up for yesterday, but missed because of our late return to the hotel. We missed an hour-long cruise we’d booked at the hotel for 5:30, but we knew that was extremely iffy. LOVE the Ramayana! Do congregants in Hindu temples still chant Rama….Sita…? LOVE INDIAN FOOD, TOO!